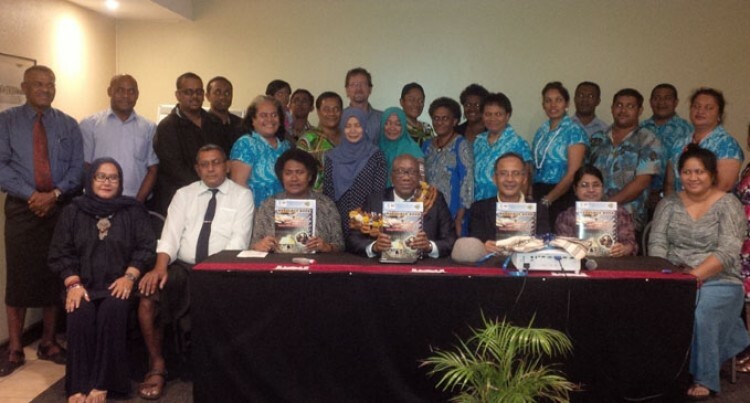 A resource book which focuses on Climate Change and Disaster Risk Management using Traditional Knowledge was launched on Monday night at the Waterfront Hotel in Lautoka. The book titled Resource Book on Disaster Risk Reduction and Climate Change using Traditional Knowledge and compiled by the Curriculum Development Unit was launched by the Ministry of Education and UNESCO. UNESCO Officer for Pacific States Alain Godonou said the contents of the resource book was enhanced after being trialled in 140 primary schools. “I would like to congratulate the staff of the Ministry of Education, Heritage and Arts for your perseverance and hard work which has enabled the completion of this resource book,” Mr Godonou said. “I also understand that selected primary schools (a total of 140) have conducted and completed trialling the resource book to improve on its contents. “UNESCO is very happy to support this resource book through funds from the Malaysia-Funds-In-Trust (MFIT) under the UNESCO-Malaysia Co-operation Programme. “We all know, education today does not sufficiently prepare learners to contribute to sustainable development and therefore themes such as climate change and biodiversity need to be integrated into the local education curriculum to ensure sustainability,” Mr Godonou said. He also congratulated Ministry of Education, Fiji on the hard work and achievements in terms of launch of this book. “UNESCO will also continue to provide support through capacity building workshops for teachers on how to effectively use this Resource Book in the classrooms,” Mr Godonou said.